Helloooo and happy Wednesday. Today’s recipe is one I put together for Dish magazine and it is a bloody delicious salad for any time of year. I love the combination of earthy lentils and tender spiced beef contrasted with peppery watercress, crunchy beans, salty feta and sweet beetroot, it is a seriously good combination, and hearty enough to serve as a stand alone dish. If you are heading away for the long weekend in New Zealand, it would make a perfect lunch or dinner dish to share with friends. Aaaand, hmm what else? Tonight I have been invited to sell and sign books at Caci Clinic in Newmarket from 5:30 – 7pm (level 1, 53 Davis Crescent) while they serve nibbles and bubbles, so if you haven’t bought a copy of Coming Unstuck yet please feel pop in and say hi! Other than that, I went to Coco’s Cantina’s birthday dinner on Monday night which was, as you would expect with Cocos, a total blast. I was literally dragging myself around in my pjs having decided I was too old/tired/grumpy/dowdy to go and had to force myself to get changed and in an uber to get there – and I’m so glad I did, with a panel of speakers which included Michael Meredith and Yael Shochat and the gorgeous Damaris zooming around serving organic, vegetarian, Italian food it was fabulous. It just goes to show it is usually worth making the effort to get out and about, even when you feel a bit poo…Next up Caci Clinic tonight then I’m heading away for a couple of nights at the weekend to attend a lovely friend’s birthday hoolie and then it’ll be back home and into the Fairfax/Cuisine/Dish cycle of recipe development and photography. Preheat the oven to 180˚C (350˚F). Put two tablespoons olive oil and five spice into a shallow dish and stir to combine. Place meat in the oil mixture and rub all over to coat. Cover with plastic wrap and refrigerate for at least an hour, until half an hour before cooking. Line an oven dish with tinfoil. Bring a medium pot of water to boil with bay leaves and garlic. Add lentils and cook 15-18 minutes until just cooked. Drain well. Trim beetroot and put in the centre of the foil. Drizzle with one tablespoon olive oil, balsamic vinegar and honey. Season well with salt and pepper and draw the sides of the foil up and scrunch to secure as a sealed parcel. Cook 40-45 minutes until beetroot are soft all the way through when pierced with the tip of a sharp knife. Increase oven temperature to 200˚C (400˚F). Leave beetroot to cool for 20 minutes then slip off the skins. I advise wearing gloves and using a small sharp knife to make this process easier. Put a roasting dish in the oven to heat up. Bring a frying pan to a medium-high heat and sear the fillet for a minute (or a little more to achieve a good dark colour) on all sides, including the ends. Transfer the fillet to the hot roasting dish and cook a further 23 minutes. Remove from the oven and rest, covered in tinfoil and a folded up tea towel, for at least 10 minutes. Bring a pot of water to boil and drop in beans for 2 minutes then drain well. Whisk all of the dressing ingredients together to combine. 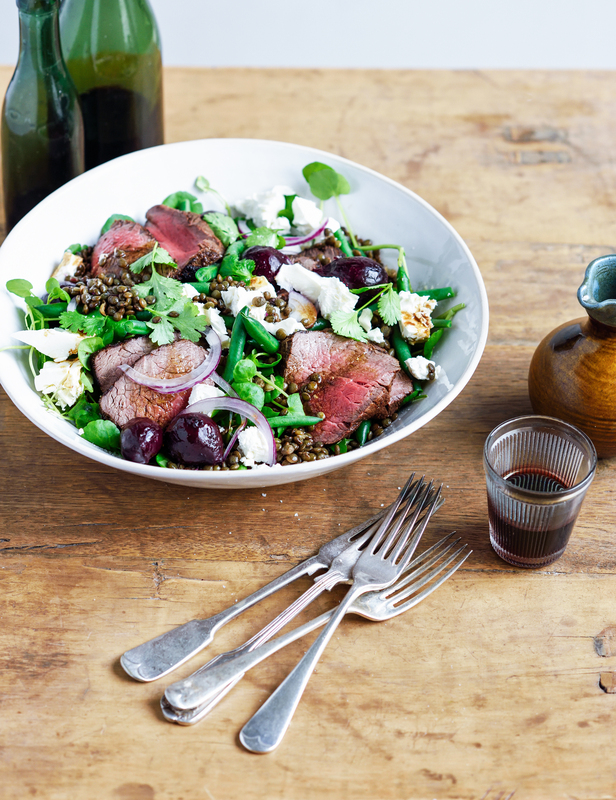 To serve, layer lentils, watercress, sliced beef, beetroot, feta and coriander into a large serving dish. Drizzle with dressing and season with a little extra sea salt and freshly ground black pepper to serve.